The HY-eVision² 10.4 product is a 1024×768 pixel 10.4 inch operator interface and sets new standards with respect to maximum resolution, programmability with CODESYS® 3.x and user friendliness, for example through the ability to display and create PDF® documents. Its display is characterized by low reflection and high color saturation and provides optimal readability in any lighting conditions. 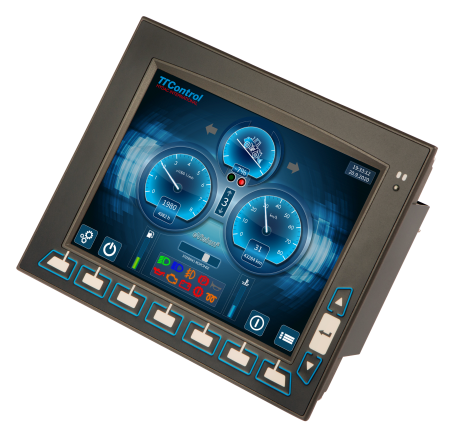 Seven programmable control keys, three hard-keys and a touchscreen allow the creation of an easy-to-use human machine interface. With its aluminum die-cast housing, the HY-eVision² 10.4 is also perfectly suited for harsh conditions in automotive vehicles. It may either be mounted in the vehicle dashboard or through a RAM ball elsewhere in the vehicle cockpit. The HY-eVision² 10.4 can display engine and hydraulic control data, as well as logging data, operator behavior, and diagnostic information. All these data can be exported through an attached USB stick. In addition, it’s possible to connect two external analog cameras which allow quick installation of a rear view system.